The loss of a loved one often comes with grief. And sadness. Let’s be honest: death is a delicate subject to talk about. It can be hard to discuss and brings emotional discomfort. But what good brings avoiding this subject, or even tabooing it? The designers at Beyond Life like to provide a different perspective tot this inevitable part of life. There is a great variety of ritual and ceremony for our diseased. From burial and cremation to grotesque celebrations. To weeks or months of mourning in some cultures. Despite of cultural and religious differences, we all seem to share the need to honour the memories of our loved ones. We would like give some special attention to ‘Beyond’. A Danish initiative to positively contribute to your personal experience of dealing with the loss of a loved one. 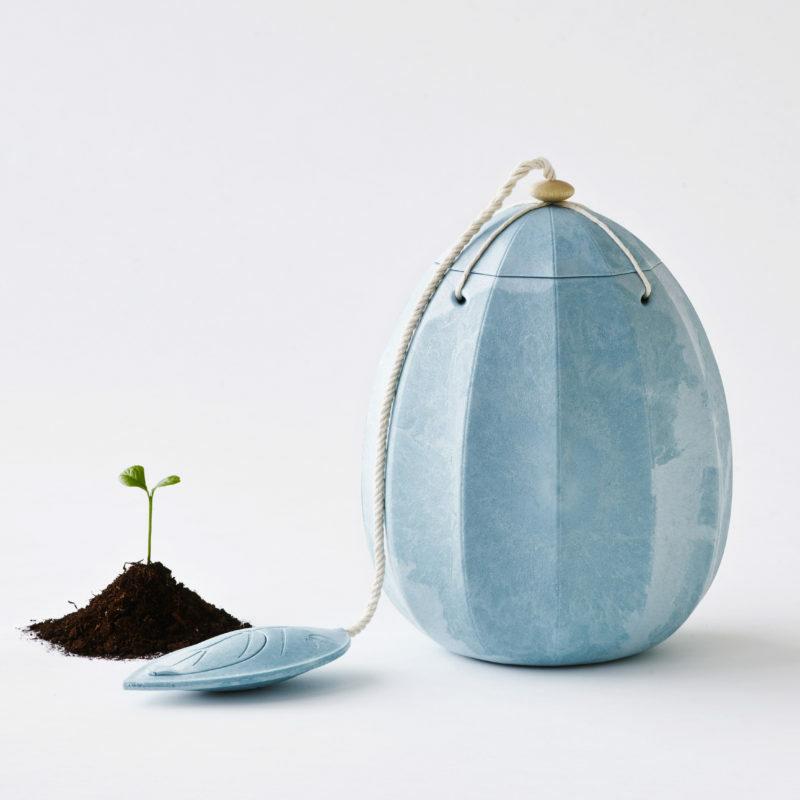 This urn is inspired by nature. Along with the large container for the ashes it has a leaf-shaped compartment containing seeds. After lowering the urn into the ground, the seeds will sprout flowers and a beautiful memory tree. In this way, the urn becomes a vessel for new life. It nurtures the soil and starts growing new life in a 100% organic way. The weight of the initial pulp version was 265 grams, and the weight of the Paperfoam urn is 100 g. Together with biodegradability and CO2 efficiency in production, this is a big improvement.